Manual/semiautomatic placer specialized for CSP, BGA and QFP placement. Vision with split optic enables picture overlay of board and component for easy alignment. Motorized axis for automatic placement. Complex components such as BGA or QFP require special optical aids for placement, even for manual or semiautomatic placement for prototypes or small batches. 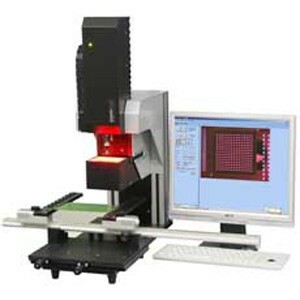 The Microplacer MPL3100 is a versatile placement machines for such applications. They allow highly accurate placement of modern components, such as BGA, Micro-BGA, CSP, Flip Chip and fine pitch QFP.